• Last Five numbers and Full number statistics across games. Live bots play along to give the feel of an online multiplayer roulett table. 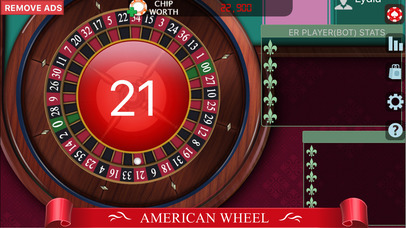 • Track personal session stats and Compare ruleta scores with friends on social networks. • Shop to buy virtual items. Leader Board to view world wide, country wise rankings of virtual money, items. Hall of Fame lists players’ pictures. • HD Graphics ( 3d rendered ) support all iphone, ipad versions and make table easy to read & place bets. Just spin the wheel and experience Vegas . • Try different strategies. Learnt strategy does not guarantee success in real money gambling. • Coming soon — La Partage & En Prison French Rules and call / announced bets (Voisins du Zero, Orphelins, Tiers du Cylindre ).